SINGAPORE, 12 November 2015 – Look no further, Star Wars fans. 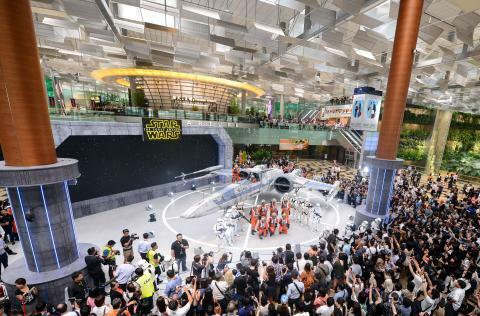 To kick start its annual year-end festive celebrations, Changi Airport is bringing a part of the galaxy far, far away to fans, travellers and visitors alike, with two of the film series’ iconic starfighters landing in Singapore for the very first time. From 13 November 2015 to 5 January 2016, airport visitors can embark on an intergalactic adventure at Terminal 3’s (T3) Departure Hall, where a life-sized X-wingTM fighter takes centre stage. Guests will be treated to the ultimate photo opportunity as they get the chance to don Star Wars costumes and take the hot seat behind the controls in the cockpit. Photo memorabilia will be made available for visitors to bring home for free. The X-wingTM fighter experience at T3 will not be complete without special appearances by the well-loved characters of Star Wars. Avid fans can look forward to the weekly character greetings featuring X-wing fighter pilots and Imperial StormtroopersTM every Saturday at 4pm, from 14 November 2015 to 2 January 2016. There will also be opportunities to win exclusive Star Wars merchandise at the same time. The quest continues right behind the LED backdrop where the humanoid protocol droid C-3POTM stands by his very own ‘language centre’, teaching airport visitors popular Star Wars phrases in 10 commonly-spoken languages. Fans will also be thrilled to find a showcase of Star Wars model displays such as that of the Millennium FalconTM and Star DestroyerTM. Over at Terminal 2’s (T2) Departure Hall, another signature starfighter of the First Order stands tall. The TIE fighterTM guarded by five StormtroopersTM in the latest incarnation of their armour, is a sight to behold. Passengers travelling through T2 can also expect to catch a glimpse of a Star Wars-themed gate holdroom and aerobridge at gate E26, where more life-sized figurines of the First Order StormtroopersTM and the astromech droid R2-D2TM are stationed to welcome passengers. The year-end celebrations at Changi Airport will also include other fun-filled activities and performances that will delight even the youngest of visitors. Children will be enthralled by the resident holiday favourite, a bouncy playground, located at T3’s Departure Hall (Check-in Row 11). Inspired by the Hardangerjøkulen Glacier, one of the filming locations of Star Wars, the Norway-themed playhouse features a four-metre high slide, an illuminating ball pit, a ski slope and even a rock climbing lighthouse station for juniors to conquer. While the young ones have their fun, families and friends can enjoy some friendly competition as they navigate through an obstacle course with the BB-8TM App-Enabled DroidTM by Sphero, the little duo-spherical robot that will make its big screen debut this December. Travellers also have more reasons to check-in early this festive season. With captivating displays of world famous icons such as the London Bus, the Tower Bridge, and the majestic Plaza De España of Spain in the airport’s departure transit halls, photo opportunities will be aplenty. Over the course of the holiday celebrations, airport visitors can also look forward to being entertained by interactive stage and roving performances. In addition to Star Wars: The Force Awakens luggage tags, tote bags and stickers, fans will be delighted to knowthey can collect a full set of eight limited-edition Star Wars plush toys exclusively available at Changi Airport. Featuring popular Star Wars characters YodaTM, ChewbaccaTM, Darth VaderTM, Boba FettTM, StormtrooperTM, BB-8TM, C-3PO and R2-D2, each of these plush toys can be purchased for S$6 when released, with a minimum spending at Changi Airport. iShopChangi.com shoppers and Changi Rewards members will also be entitled to exclusive redemption privileges. From 23 November to 11 December 2015, fans also stand a chance to attend a movie screening of Star Wars: The Force Awakenspremiering on 17 December 2015 in Singapore, and win more Star Wars exclusives, by participating in online contests on www.changiairport.com/starwarsand www.facebook.com/changiairport. For activity timings and terms and conditions, please visit www.changiairport.com/starwars. Ticket numbers will be issued on a first-come, first-served basis over four photo sessions everyday: 10am – 12pm, 1pm – 3pm, 4pm – 6pm (except Saturdays), 7pm – 9pm. With minimum spending of S$70 (S$140 at supermarkets) in Changi Airport’s public areas, or S$150 in the transit areas in a same-day single receipt. Designs subject to availability, while stocks last. 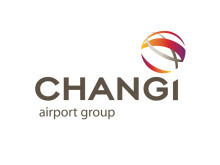 Changi Airport is the world's sixth busiest airport for international traffic. It served a record 54.1 million passengers from around the globe in 2014. More than 350 retail stores and 160 F&B outlets are situated across three terminals to cater to passengers and visitors. With over 100 airlines providing connectivity to 320 cities worldwide, Changi Airport handles about 6,700 flights every week, or about one every 90 seconds.